it’s DT THURSDAY SISTAHS! with TRACYBELLA! Hi Everyone! Tracy here. 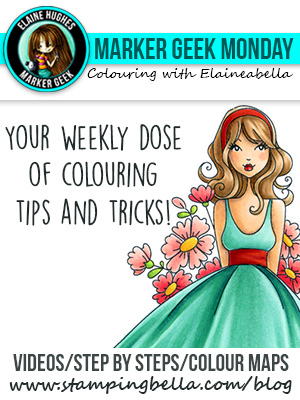 Today I am sharing a quick and easy technique to make a watercolor background. You can use whatever watercolor inks/paints you have but today I am using Tim Holtz Distress Inks. Here is what you need to get started. 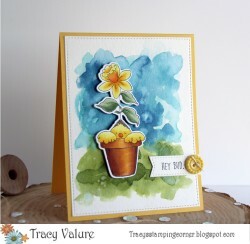 I’m using Budding Chick Stamp and Budding Chick “Cut it Out” Die. 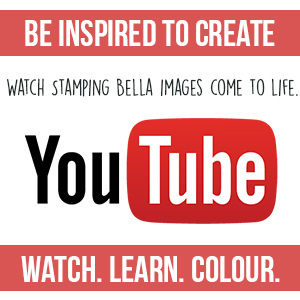 You will need a 4 1/4″ x 5 1/2″ piece of watercolor paper. 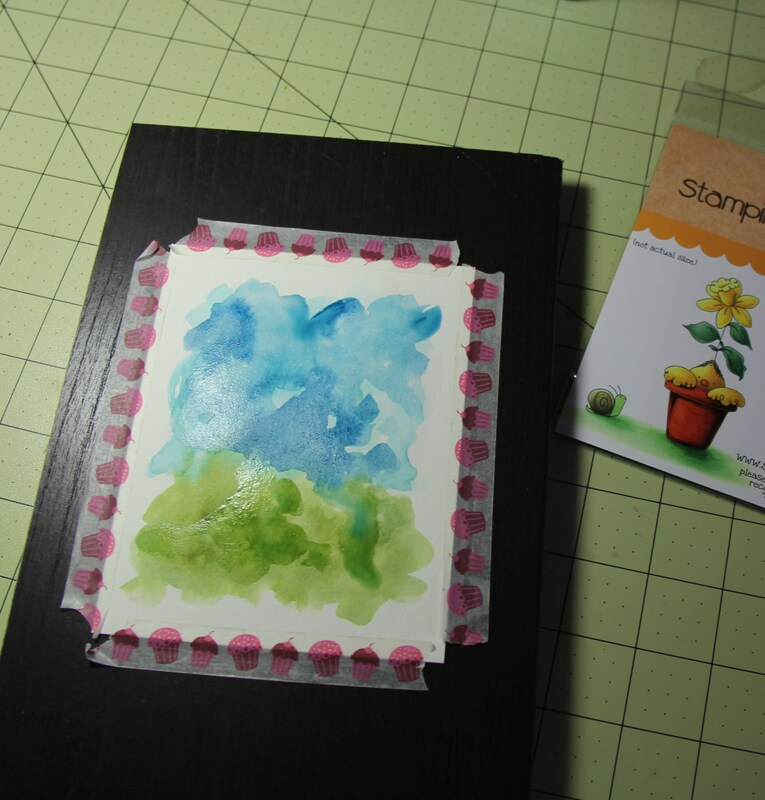 For backgrounds I use a cheap paper – Artist Loft. For Images I use Canson or Strathmore. 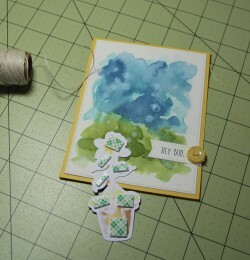 The inks that I used are: Tim holtz Distress Inks in Broken China, Faded Jeans, Peeled Paint and Bundled Sage. You can use the pads or reinkers. 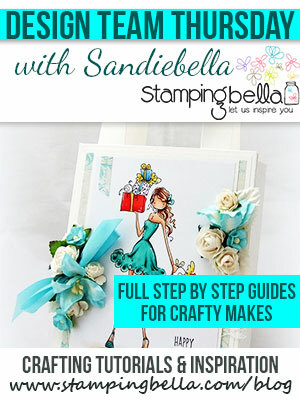 If using the pads just stamp onto a piece of plastic or something non-porous so that you can lift the ink with your brush. 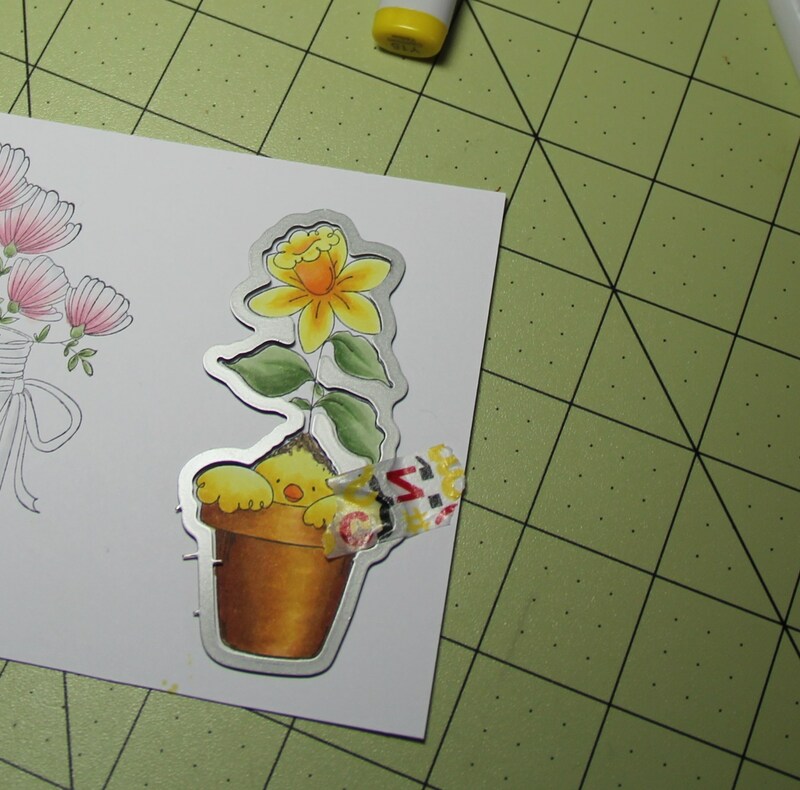 Because I dry my paper between layers – I have this piece of board I use so the heat doesn’t damage my table. You can do whatever you normally would do. I then tape the edges down. 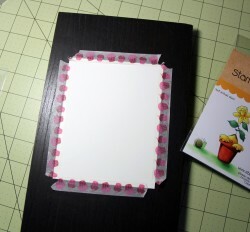 This helps in keeping the paper flat and not getting wonky when adding water to it. 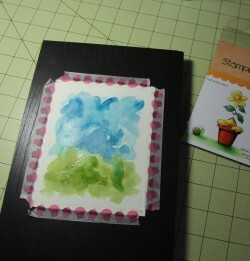 You can use painters tape, I just use some old washi tape. I like washi because it doesn’t tear the paper. After you have your paper adhered, wet the paper with plain, clean water. Then lift some of your Peeled Paint ink and start dabbing onto your paper to create the “grass area”. Do the same above with the Broken China. 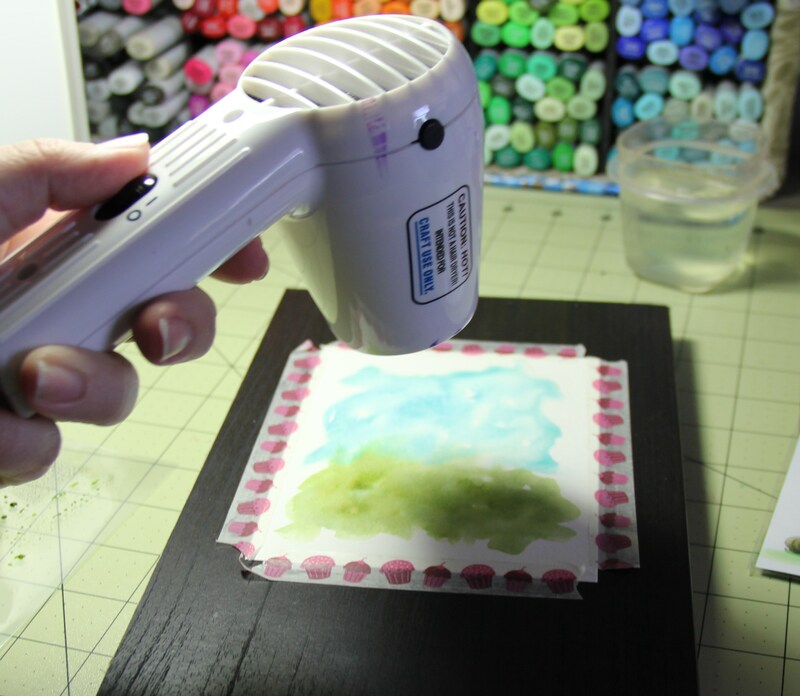 After you add in your inks – heat your paper to dry it. You could just let it dry naturally but I’m antsy and when I work on something, I want to complete it. 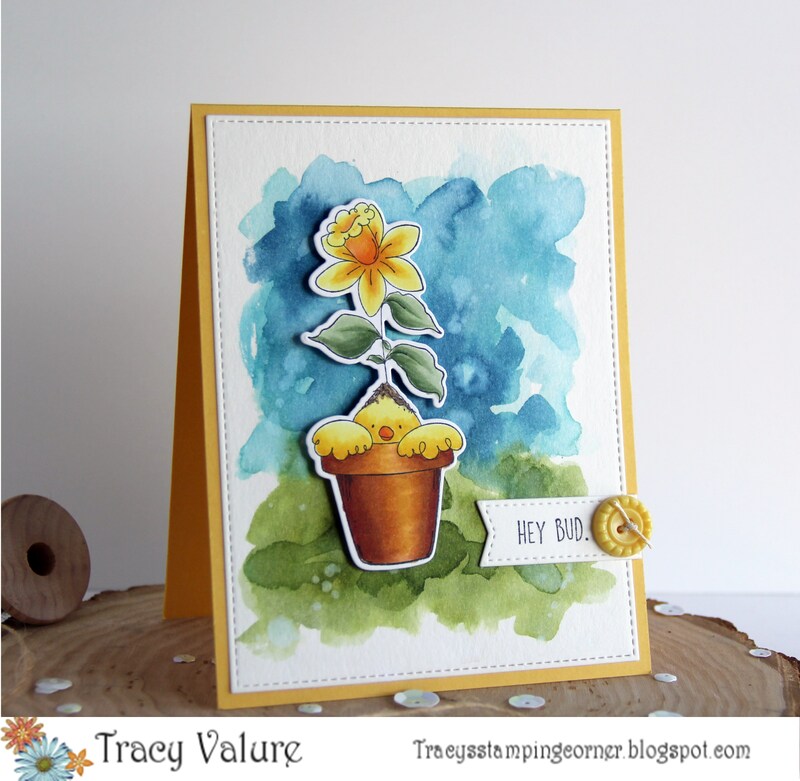 If you do not let your layers dry in between your inks will get muddy!! You have to dry in between layering. Now you can go on top and add in a couple of dots of the Faded Jean and Bundled Sage. If it’s too harsh just add some water to the top and let it spread out a bit. You can also take a paper towel and dab it. On my final background you can see that there are couple “bleached” out spots. After I added my 2nd layer of colors, I dried it again. Then I took my brush, added some plain water to it and flicked it onto my paper. Let it sit for 10-30 seconds and then took a paper towel and dab the background. Now onto Coloring the Budding Chick. 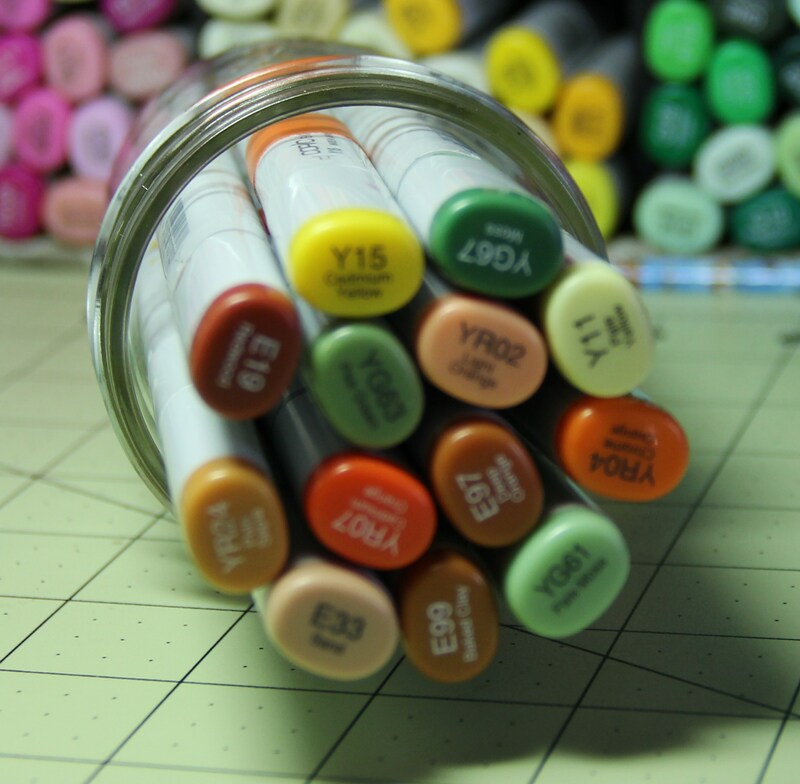 Below are the colors I used. Sorry for the blurry pic….my camera did not want to cooperate! 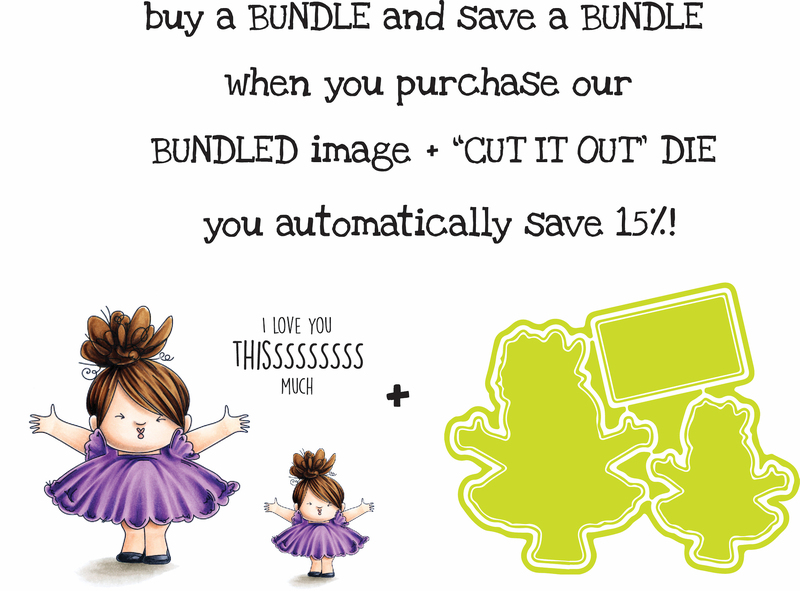 After your image is all colored you will then cut it out using the Budding Chicks “Cut it out” Die. Add some foam squares to the back to “pop” it up. I finished off my card by cutting out the background with a stitched border. 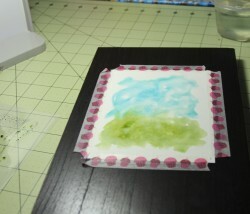 Then used a heavy adhesive, like scor-tape, all around the edges to adhere my background. 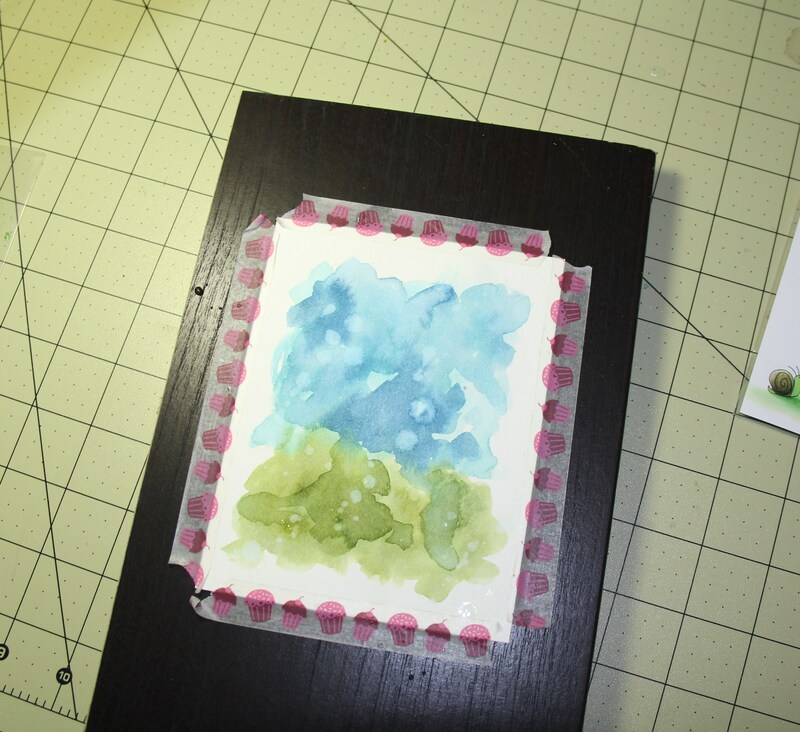 Watercolor paper can get a little wonky, taping it down as we did in the first step will help though! Just use a good strong adhesive. Next I added a small flagged sentiment and finished it off with a button. Great technique demonstration. Very good and informative. Thanks. 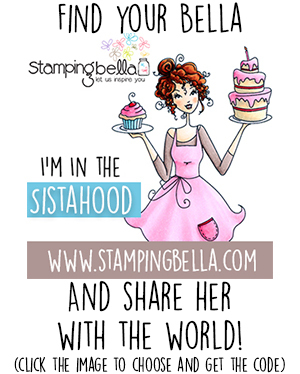 I love all the new Bella’s…….from the harried gal from 2006 making the cake with her hair flying around to the new Bella in her Crop Pants with her cocktail in her hand……boy we have changed! Love them all. Oh no! My craft budget is going to take another hit… These are going to join me in my craft room!